Call me OCD, but if it's Not on the Calendar, We Don't Have a Meeting! Back to our topic. 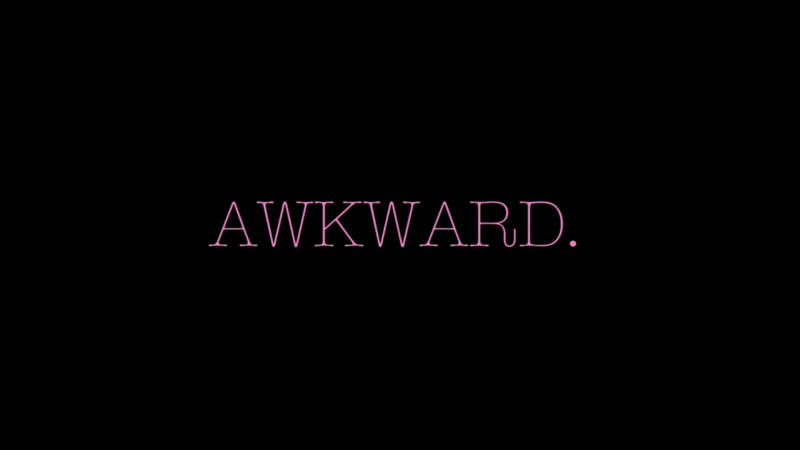 I cannot think of many things more awkward than a scenario that happened to me a few years back. There I was, in a meeting over lunch eating a nice juicy steak. Then a lifted my head from the beautiful specimen on my plate and saw a familiar face enter the restaurant. I knew this dude. 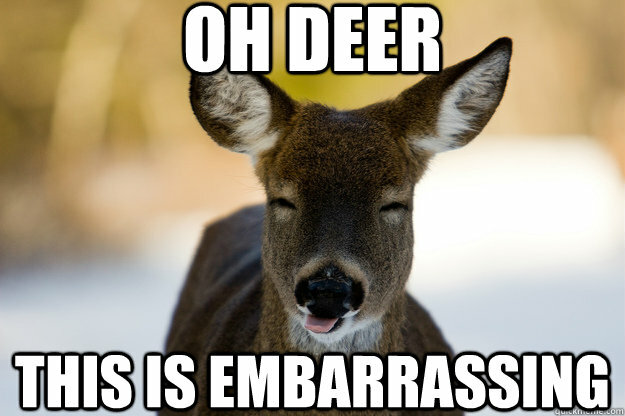 What happened next was downright embarrassing. Sure enough, that familiar face was a guy I knew who came to the restaurant to meet me. We had agreed to meet there at that time. I had asked him to send a calendar invite so it is locked in. He missed that email perhaps, or maybe he didn’t think that calendar invite was all that important. So there I was, in a meeting with person A, with person B standing there expecting to meet me. I was double booked. It got awkward fast. He literally had to turn around and leave, it was just very unpleasant. 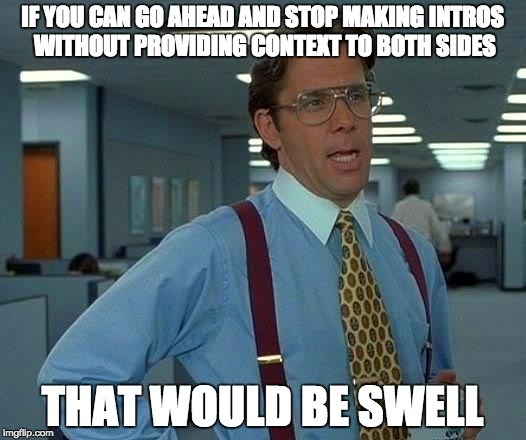 This has happened, in different variations over the years, especially when a non techie is one side of the meeting. 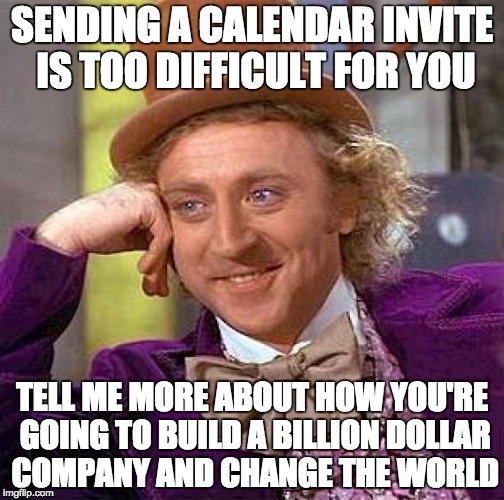 Somehow I find that outside of the tech business world, calendar invites are less of a thing. In fact, many people over the years, people who were less geeky than you and I, literally asked me how to send a calendar invite. I sent them a “Let me Google that for you” link. I love that site. Whoever came up with that site deserves a Nobel prize. What were we talking about? Oh yes, my obsession with locking things in the calendar. 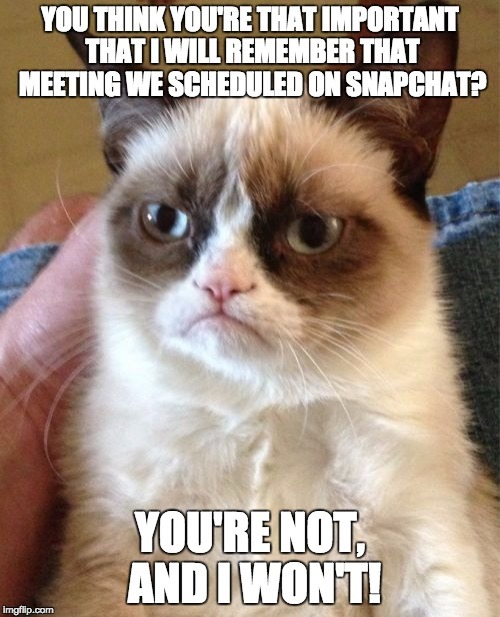 So, the bottom line, if you are scheduling a meeting, part of that process absolutely needs to be sending a calendar invite. Why? Because people are busy, first of all, and they won’t remember this conversation in thirty seconds when their friend’s cat picture pops up in their FB feed. Second of all, like it or not, we are trained today, to not think and to not remember. It doesn’t matter how many times I drive to a certain destination, I will use Waze every single time. 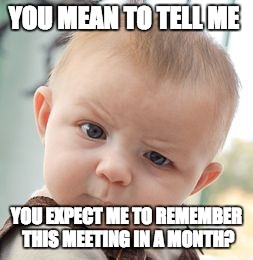 We are trained not to think and meetings are no different. Send a calendar invite. Which leads me to my next point. Who should send it? Simple, the person who initiated the meeting, which is in most cases, the person with the ask. In other words, if you are asking to meet me and we agree on a time and a place, don’t ask me to send the invite. No, it is not a huge deal and it takes 20 seconds to send, but just like you wouldn’t ask me to call you long distance if you are seeking my advice, don’t put me to work with a calendar invite if you are the one asking me for help. That sounded better in my head. Not a huge deal, just kinda a social norm. 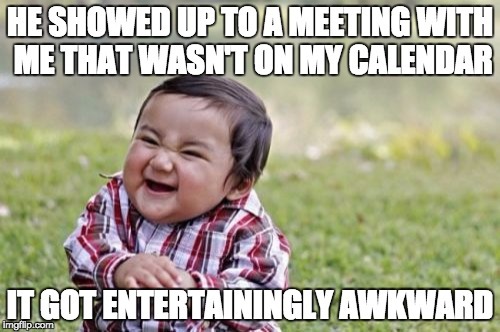 Long story short, someone asking you to send them a calendar invite might seem OCD to you at the time, but the alternative of showing up at the meeting and that person not being there, or even worse, being there, but not having the time to meet with you, is worse. A lot worse.